Thank you so much, Doratta! Have lots of fun making the tamales. She let me know they were vegan. I saw your recipe for sweet potato tamales. Yummm!! They are excelente and easy to make. Thank you Pati I love you cooking and personality. Oh I hope your friend is doing well, Antonia…and I’m so glad you enjoyed making the tamales. These came out delicious, one of the best veggie tamales I’ve ever had. Thanks Pati. Awesome! So happy to hear this, Kathy. Making these tomorrow! Cannot wait. What a wonderful flavor combination. I plan on making a salsa roja with guajillo and chipotle to drizzle on top, I think it will go well with these flavors. Stay tuned! Mmmmmm….hope you love it all, Jacqueline. Oh those are all from different seasons (6,4, and 3)…here are the recipes: https://patijinich.com/recipe/mexican-grilled-steak-salad/ https://patijinich.com/recipe/tuna-minilla-casserole/ https://patijinich.com/recipe/drunken-rice-with-chicken/ Enjoy, Wanda! I’m going to try substituting the sweet potato with acorn squash which I have dozens in the garden. I’ve made tamales with sweet potato using your recipe and they were fantastic. Except that the squash might have a bit more liquid in the flesh, in which case I might adjust the amount of broth, I’m guessing it could work just fine. Any thoughts? Give it a try, Tim… and let me know how it goes. Hola Pati, acabo de ver tu programa, lucen espectaculares esos tamales y todo el complemento que hiciste para acompañarlos. Definitivamente voy a intentarlos. Mil gracias por hacer la cocina más divertida. Not gonna lie, I’ve always been able to eat about a dozen tamales. Soy una comelona! Can’t wait to try this!! dish. Would like the salad recipe. Here it is: https://patijinich.com/recipe/avocado-watercress-and-pecan-salad/ Enjoy! 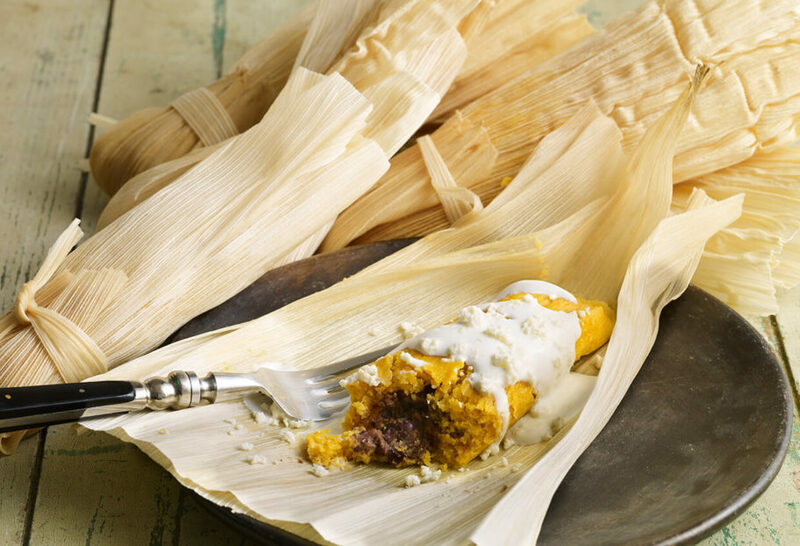 So happy to get the sweet potato tamales receipe,they look so good when I saw you making them. Have fun making and eating them, Willie! I saw an episode where a recipe for elote was featured. The result was a creamy corn mixture. It may have been the episode showing street food. Can I have the link to those recipes? Here’s the corn recipe, and the others from the Street Food Episode. Enjoy them, Jessica! Hi Pati – I love your program! Can you please give us the recipe for the salad (and dressing) that you did on this program also? Does, Pati have a meat Tamales recipe.???? Oh here it is Deborah: https://patijinich.com/recipe/coloradito-chicken/ Enjoy! I have allergies to corn and wheat flower….is it possible to substitute with garbanzo or quinoa flower? ​Yes absolutely, give it a try! Oh. My. God. These are to die for, absolutely to die for. My sister, husband, & I all have different tastes yet we all loved them. If you double the recipe can you freeze them? I’m so happy you loved them! They can be frozen for months…then reheat them a steamer – about 45 minutes for frozen tamales. Hi Patty. Not sure if my last comment went through or not. Do you think it would be ok if I cut back on the shortening to save calories? Hi, Patti! Can you used butter instead of the lard or shortening? Have loved your show for years! And meeting you at Mexican Fiesta in Milwaukee a few years ago. Making these two recipes today for Christmas Eve dinner. Feliz Navidad! It was so great meeting you Michelle! I hope you had a delicious Christmas Eve! I’ve never made tamales before! I love learning in the kitchen and trying new recipes. It gives me such a boost of confidence in myself and my cooking! Oh that first bite is always so amazing! I have never made tamales before but watching your show really inspires me to expand my learning in the kitchen! I love learning and trying new recipes it builds up confidence in me and my cooking. Thank you so much Annette for your comment! I’m so glad you were inspired and have more confidence! HI Patti really enjoy all your shows. For this Sweet Potato and Black Bean Tamale recipe — is the secrete to a fluffy tamale using a beater and beating until light and fluffy? Can I use a prepared masa for tamales that I can buy in my local store? Yes you want the masa to be light and fluffy…and you can use prepared masa. What would the masa/sweet potatoe ratio be when using prepared masa? Hello Pati , I love watching your show. I am so glad I tuned into you show today I got the tail end of the where you were spooning the tamale mass on the husk. My daughter loves tamales but does not eat them any longer bcz she has became a vegan for over 5 yrs now and I feel bad st xmas time when we all are eating beef, chicken , green chile and cheese, or pork tamales. I would love to make these with her. I can’t wait to taste them for myself they look so smooth and fluffy and with a little bit of sweet yummy I love sweet… lol thank you for your time and your recipes . I hope you and your daughter enjoy them and have a happy holiday! Happy Holidays to you too, Elena! My girls are 5 &7 yrs old (have a son too1yr old ) we love watching your show together. They call me in when it comes on its “our show”. I love how your boys cook with you. Food is such a great way to bond and be creative. I love how close we feel as we cook together. I only hope my children will continue to spend time with me in the kitchen as your do. You are so inspiring as a cook and a mother! I hope you and your three kids have many fun-filled kitchen adventures together, Annie! Hi Pati, Im from México and I never see the mexican recipes like i do now!! Really love your program and I want to start cooking with al the mexicans flavors! Thanks for your recipes!! Thank you for tuning in with your kids Liz! I don’t track the nutritional information. Hoy vi tu show y lloré y lloré!!! Soy mexicana y vivo en Colorado, la verdad me dieron ganas de regresar a México, no se cuando voy a volver, pero una cosa que sí voy a hacer es cocinar tus recetas tan deliciosas y llenas de sabor, pero sobretodo de amor, nosotros los mexicanos relacionamos mucho el amor a las personas y el invitarlos a comer comida preparada por nosotros mismos, ahí está nuestro cariño, y el tiempo que invertí en prepararla y sobretodo la satisfacción de saber que les gustó! Eres una mujer muy especial, bendiciones para ti y tu hermosa familia!!! Gracias por tu mensaje tan lindo, Liliana! Thank you so much Cher!!! Can’t wait to try this recipe. I love all kinds of ethnic cuisine but my husband is a meat and potato man. He does love tacos and enchiladas rice and refried beans. I think he will like this dish. Thank you so much for your show. I hope he enjoys the tamales, Kay…and many other recipes :). This looks so good. In New Mexico we make our traditional pork tamales with red Chile. I’ve always wanted a sweet one and something different.. I just saw your show for the first time and loved it. Thank you for your passion with food. I’m so happy you discovered the show Claudia! These tamales are perfect for Thanksgiving. I absolutely love your show and your charisma. I am Salvadorian and I relate so much to Oaxacan food because our ingredients are so similar. Thanks for sharing all the history and culture. Thank YOU Eugenia for your message! Obviously, you add some sweet potato with the black beans before you wrap the tamales? I incorporate the sweet potato directly into the masa. These sound really good and my “Nebraska Box” of fresh organic vegetables has sweet potatoes in it this week. I have the rest of the ingredients in stock Yay! Tamales for dinner. Do you have a video of how to make this recipe? I saw this episode on Saturday and this tamale looked delicious! Also appreciated the vegetarian feast you made! I was hoping to use this sweet potato masa and black bean combo to make a modified tamal casserole from your Mexican Today cookbook. Is there a specific salsa you would use to layer in and keep things moist? I have low vision and can no longer read my email. Is there any way that I can receive your recipes in the mail? I will, pf course, send money for postage. I’m a new viewer of your show and look forward to it every week. Thank you for your time and attention. Thank you so much for watching Kathy! I’m so happy you discovered the show. You can print the recipes directly from the website and on your printer zoom in to make the text bigger. The print button is to the right of the recipes title and just above where the amount of servings is written. I hope you enjoy the recipes! I love watching Pati’s Mexican Table. Pati explains so perfectly how to remake her recipes and the history that makes each one so rich and flavorful.